This is a high power, fast and long range front wheel 1000W kit that uses the latest in PANASONIC lithium ion battery technology to have a great range in 48 volts. It’s available in either 26″ or 700c rims. Other sizes require us to build the motor into a rim size of your choice. You need to have a set of rigid forks to install this kit, it’s not suitable to put on a suspension fork; steel fork is best, carbon can’t be used. You must install the torque bar when using this kit. 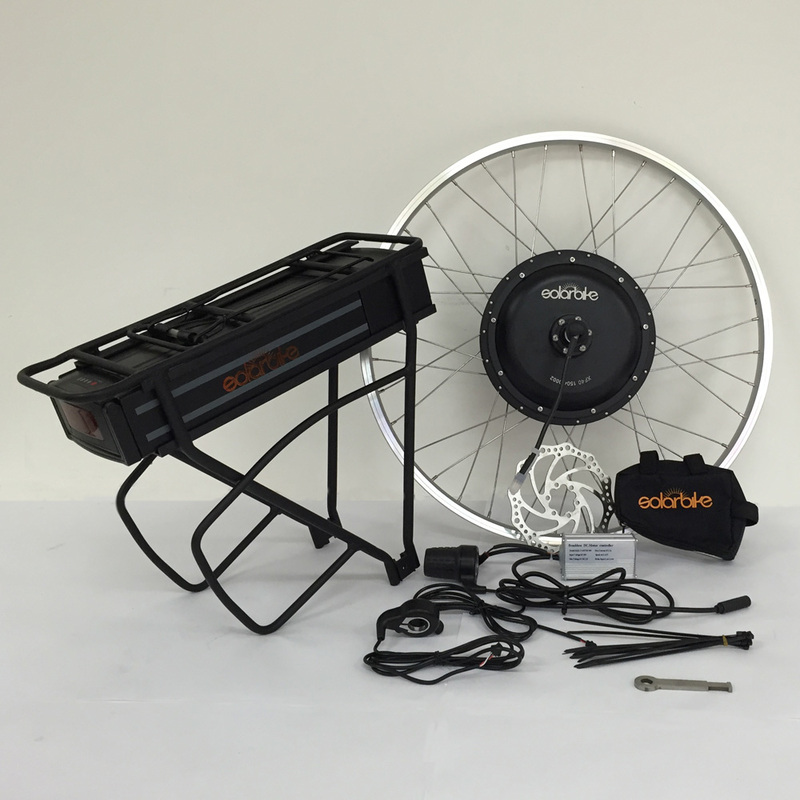 The complete kit includes a PANASONIC 48V 17Ah rack battery, 48V lithium ion battery charger, motor laced into ALEX DH18 rim with stainless steel spokes, motor, controller, twist grip throttle, thumb grip throttle, torque bar, cable ties, disc, inner tube and instruction manual. All kits are disc compatible. 200W is the legal limit for riding on the road. Battery: 48V 17Ah PANASONIC Rack Battery. Click here for specifications. Rim sizes available: 26″ or 700c. Range and Speed: 42km/h. Range approximately 35km with light pedalling. Delivery: $45 for delivery Australia wide. Free pick up from distributors. Information: Kit includes PANASONIC 48V 17Ah rack battery, 48V lithium ion battery charger, motor laced into ALEX DH18 rim with stainless steel spokes, motor, controller, twist grip throttle, thumb grip throttle, torque bar, cable ties, disc, inner tube and instruction manual. All kits are disc compatible. 200W is the legal limit for riding on the road.